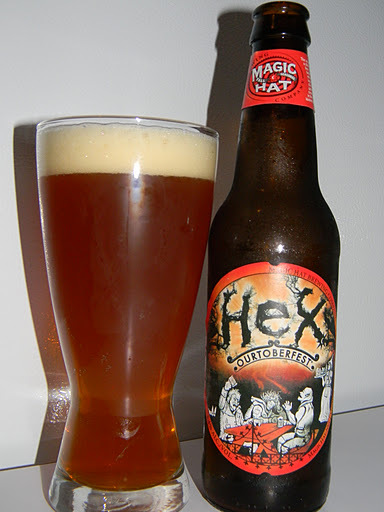 October | 2011 | Beer Apprentice - Craft Beer News, Reviews, Interviews and Info. For today’s craft beer review I’m going to be trying the last Octoberfest styled brew in my possession. It’s the Bell’s Octoberfest brewed by Bell’s Brewery, Inc. located in Kalamazoo, Michigan. Fortunately, I have access to most all of the products that Bell’s releases, but for some reason I have yet to try the Octoberfest, so I figured I better do so before the season ended. Here’s the description from the website, bellsbeer.com. Crafted as a flavorful session beer, Bell’s Octoberfest Beer is perfect for a week-long wedding celebration in Germany or the start of the Michigan autumn. As with Bell’s Lager Beer, Octoberfest spends a full six weeks maturing in the fermentation vessels. Unlike its cousin, Octoberfest trades in the assertive hop presence for a focus on a light caramel malt note, lending body without too much sweetness. In order to best preserve the flavor & shelf life of the beer, it is recommended Bell’s Octoberfest Beer be kept refrigerated. Bell’s Octoberfest comes in a 12 oz. bottle and has an ABV of 5.8%. The aroma consisted of a prevalent caramel malt. Lightly toasted notes of wheat and grain combined with a hint of leafy goodness helped create a very round and “earthy” fragrance. Deep within the smell I began to detect hints of very relaxed spices that seemed to add a touch more complexity than initially thought. The taste delivered more of the caramel malt along with a bit more of the spice. Nutmeg and maybe cinnamon. A very mild hop bite was felt, which lent to a minute bitterness. Some toasted biscuits were welcomed and I also discerned a very, very light, dried apple chip type of flavor. Again, very earthy and round with the taste. The mouthfeel was medium, smooth, clean, crisp, refreshing, dry and somewhat thirst quenching. Not a whole lot of flavor was left behind on the palate. It vanished relatively quickly. Well, I thought that this was primarily an average Octoberfest. It wasn’t anything bad or horrible, but more or less straight forward I thought. It’s definitely worth a try as you make your way through the seasonals, but don’t expect a world class beer. The Bell’s Octoberfest is easily drinkable and has plenty of flavor and appeal, but I’ll tell ya, I’m glad this is my last Octoberfest of the season. They are all starting to taste the same to me. So with that being said, pick up a bottle before the season is over, give it a try and let me know what you thought of it. Thanks for reading and commenting everyone. Remember to look me up on Twitter and Google+ if you would like to discuss craft beer a little further. Until next time. On a side note, I thought I would give a run down of the Octoberfest/Oktoberfest beers that I tried this year. All in all, I tried eleven different ones. For today’s craft beer review I’m going to be trying the Rodenbach Grand Cru produced by Brouwerij Rodenbach N.V. located in Roeselare, Belgium. Let’s not waste any time and let’s find a description from the website, rodenbach.be. 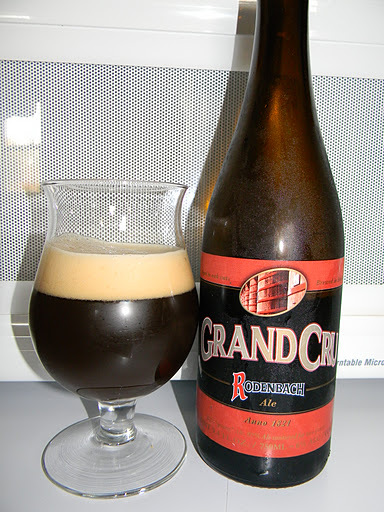 The Rodenbach Grand Cru has an ABV of 6.0% and it comes in a 25.4 oz. bottle. The beer poured a very deep, clear, ruby to burgundy color. The crown was light tan and it had a very nice size. It was soft, light, creamy and smooth. The retention time was adequate and the lacing looked very good. The head settled to a nice, silky smooth film right on top of the liquid that lasted the duration. The aroma brought forth wonderful hints of deep cherries and over ripened grapes. The sourness seemed relaxed, but otherwise duly noted. Fragrances of aged oak and yeasty goodness added some well rounded complexities. Deep within the nose I also found hints of buttermilk. Overall, the bouquet was very well balanced, forthcoming and complex. The taste bumped the sourness up just a bit. Some of that commonplace vinegar started to pull through as the beer worked its way across the palate. A well received tartness bit the tongue by way of sour grapes and ripe cherries. A delightful sugar tone was noticed, which added even more sweetness, followed by the “oak” acting as a complimentary backdrop. Only a very minute redolence of alcohol was noticed. The taste definitely resembles a “reserved” red wine. The mouthfeel was medium, snappy and very dry. It started with a sharp bite that really became smooth and velvety as I made my way through the glass. The flavor seemed to stick to the palate long after the sip. A very, very nice mouthfeel with this one. I’ll tell ya… I really liked this beer. Tons of aroma and flavor abound. It’s super easy to drink with the relatively low 6.0% ABV also. I would be more than happy to revisit this beer again sometime in the near future. If you favor Sours, I would highly recommend picking this up and giving it a go. I’m slowly, but surely coming around to this style. I find myself craving a Sour at the most inopportune times. Oh well. I guess that’s a good thing. It means my palate is adjusting and working just fine. Thanks for reading and commenting guys. I really appreciate the feedback. If you would like to discuss craft beer, you can find me on Twitter @BeerApprentice and @shrews824 or look me up on Google+ (Scott Shrewsberry).